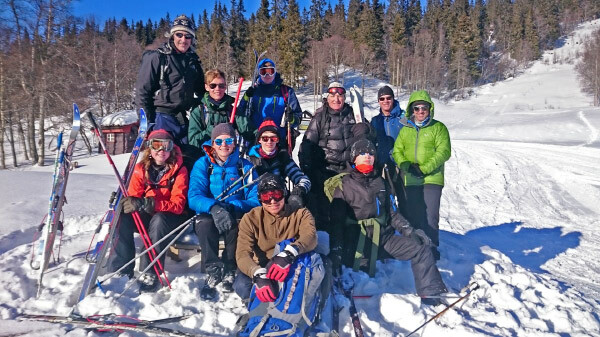 A 6-day journey of discovery by a mixed team of nine Senior Cadets and Cadet Adult instructors who were all Nordic skiing novices out on the snow making memories. A long journey from UK to Sandefjord Airport in Norway followed by a 3-hour drive culminated in our arrival on a snowy plateau 1200mts above the town of Rjukan in the early evening. Kvitvatn Fellstoge was to be our home for the week. Accommodation is made up of a series of rooms sleeping 2-3 people, with a mezzanine bed chamber for those who like a bit of privacy, think of it as a top bunk with bells on. The accommodation and food were given a thumbs up however that was nothing by comparison with the impressive view of our surroundings revealed in the early morning light during breakfast. This was so very different to my usual view at home. What’s more is that everyone speaks excellent English and are so helpful. This is a different world! Straight after breakfast we went to the local ski hire to collect our skis. 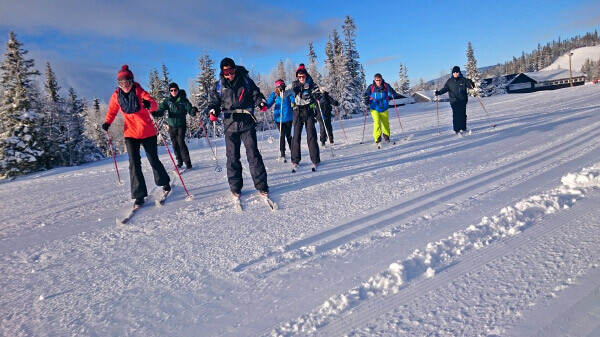 The Alpine skiers were already confused by the fact that Nordic skis appeared so much skinnier. The dawn of reality was that even if you’re an alpine skier this course is a great leveller. Following the course briefing we all had our first taste of the skills of Nordic skiing during an indoor coaching session and warm up to the day’s activities. This session was a great ice breaker and we were all feeling muscles that we never knew existed. This was then transferred from the indoors to the outdoors during which we were taught how to run on skis. This in fact was the essence of the diagonal stride technique. It quickly became apparent that every 3-year old kid could ski effortlessly as they glided past looking on with mild amusement. Staying upright on these skinny planks was already a major challenge. After lunch we were taken out on our first journey around the local frozen lake. We were stumbling around the undulating Nordic tracks for a couple of hours which seemed like a marathon but in fact we had only covered about 8kms. The locals had the right idea as some were being towed along by their dogs with minimal effort, if only we could hire a dog. However the sense of achievement was a moment to savour. Rounding off a day on the snow, we had a really useful ‘warm down’ intense yoga session, I think it was to help us be in a position to move without too much pain the following day. The review of the day was counting the number of times we had face planted in the snow. The evening was finished with a presentation on winter mountain hazards thus arming us with the knowledge to look after ourselves and each other in the super cold conditions. Morning briefing and warmups are really fun and goofy, but get your mind ready for the movements and body positions you will find yourself in during the day. Today we learned a lot about waxes. The wax we used on our skis yesterday was too sticky for today’s snow conditions. The skis wouldn’t slide. We were given a crash course on how to clean the skis and re-wax with the correct wax for the snow conditions and temperature. Taking care of them made us feel a true emotional bond. After much trial and error, we fixed the waxing issue. 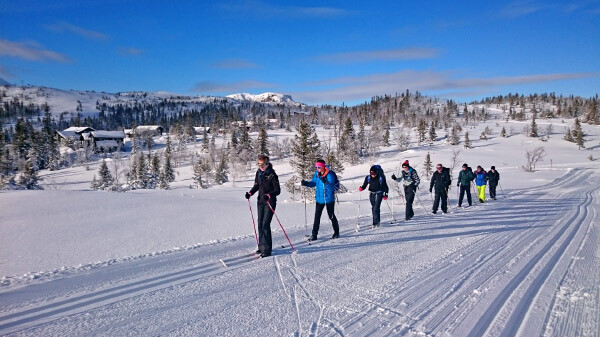 With only six hours skiing under our belts we were beginning to nail down the basic fundamentals of Nordic skiing. After lunch we once again embarked on a longer journey around the local tracks tackling the many small hill descents with much more confidence and poise. There’s nothing that feels better than the feeling of everyone moving as a team and working as one. Of course, we had to replace all the calories we had worked off. What better way to do that than a dinner pudding challenge! Some ended up begging for mercy, with a winner of six whole puddings being eaten. Young David emerging a worthy winner. 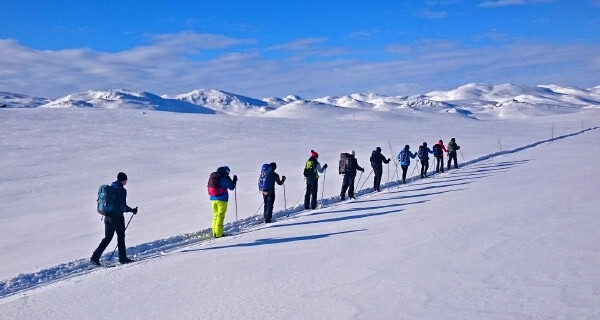 The following day was a longer tour which took us onto the higher plateau above the village of Kvitvatn. This involved a massive herringbone uphill to reach our high point. Our thighs were screaming but the rewarding views across the Gaustatoppen, the highest local mountain, were simply outstanding. The next stage was our first true taste of off piste skiing, making our own tracks in the pristine powder snow. Literally the icing on the cake was skiing off small snow cornices to be dumped ignominiously in the super soft snow. No one was graceful and everyone was covered in a coating of snow. Fresh from our off piste experience we regained the tracked area for the long downhill descent. What a thrill for the team to have reduced the number of falls down to just a few. In the afternoon our attention was turned to learning correct downhill descent techniques, more precisely the art of snowplough and snowplough turns. This turned out to be quite an emotional afternoon with lots of time spent on our backsides but eventually we managed to regain control over our skis. However the bruises were real. With everyone in high spirits we went out for a night ski in perfect weather conditions. Stars were out and the mountains were clear in view. Had a stargazing lesson whilst standing on a frozen lake. This felt so surreal and more something that other, cool people did, not kids from random places in England/Scotland. During the last full training day we undertook a long tour to test the skills we had learned over the last few days. In preparation for the expedition we were taught some important winter survival skills. We took the angle of a slope; identified the structure of snow; the snow and air temperature; and identified our position based on our surroundings. We then skied between the houses and huts through the powder snow routes around the hostel. After we got back from our morning session, we ventured down into Rjuken where we got to experience the town. After about an hour, we visited the Norsk Hydroelectric Plant. Here we learned that the plant was used to create heavy water during WWII for Nazi research into the nuclear bomb. The museum told us the story about the Norwegian saboteurs who foiled the German plot and destroyed all the heavy water they had extracted. If it wasn’t for them, the Nazis could have discovered the nuclear bomb before the Americans, and won the war. When we came back we spent time planning and preparing our equipment for next day’s expedition. It would be tough. We took the ski lift up the valley onto our starting point. After an hour of gruelling climbing up through the forest, we were greeted by a vast white desert plain of snow. White-capped mountains stretched for miles as far as the eye could see. The off piste conditions were testing underfoot and there was a keen wind mixed in with the very cold temperature. After a little over three hours we arrived at our destination which was the Hellberg Hutte, a small un-manned mountain hut. Jobs were divided up between the team and everyone set to work. Three of us prepared a hearty dinner feast whilst three of us dug for drinking water under two metres of compacted snow. We had reindeer meatball pasta, and cauliflower soup. While enjoying our meal, the outside temperature plummeted to -18 degrees C. We went out for a night ski, and stargazed on the mountains. After a half-hour ski, we were so shattered that we just passed out on our beds. Next morning, we awoke well rested with yet more work to be done. We immediately started cooking our breakfast porridge, and started our morning fire. After a nice meal and hot chocolate, we retraced our steps across the winter desert. The best part of journeying back was that a third was downhill. Teamwork kicked in with the front person making the track for the rest to follow swapping every three minutes. Our group moved like a flock of geese in formation. We picked out a relic from the past, a German anti-aircraft gun emplacement from the war. From this vantage point we had an amazing view of the plateau vista. The long climb up from the day before had become the rapid descent to the finish point and the obligatory group photo marking the end of our CADETNORSKI adventures.